This lot at Sixth and Railroad, photographed in April, has been vacant since the city of Albany tore down a house there in 2011. 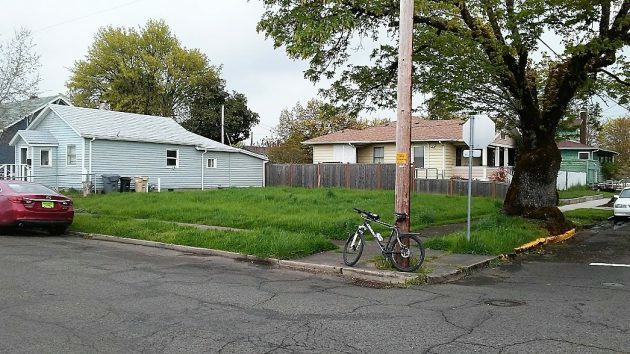 Seven years after Albany officials forced the demolition of an old house kitty-corner from Swanson Park, new owners have applied to build a home there. The Albany Landmarks Advisory Commission will hold a public hearing at 6 p.m. Wednesday, Sept. 5, at City Hall on the request by Moises and Elaine Moreno to build a two-story house with an attached garage at 337 Sixth Ave. S.E. The Morenos need Landmarks’ approval because the address is in the Hackleman Historic District. The public notice of the hearing caught my eye because I covered the controversy over the century-old house that used to sit there. The city building official had declared it to be dangerous because the structure, dating to 1890 or before, had been divided into up to six living spaces in ways the city deemed unsafe. The city condemned the building and evicted the tenants in 2009. The owner, Richard F. Draper, made alterations but didn’t take out the required permits. He told me later that without income from tenants, he didn’t have the means to bring the heavily mortgaged place up to code. The story ended on Aug. 5, 2011, when contractors for the city demolished the house and carted off the rubble. Draper lived across Sixth Avenue and watched along with several others including me. Some time before, the city council had voted 3-2 against developer Scott Lepman’s proposal to buy the place and fix it up with urban renewal funds. Draper died on Oct. 15 the following year, 2012, at the age of 83. As a young man he had come to Albany to build houses with his brothers and his dad. This story has been edited to fix a mistake in the address. It’s S.E., of course, not S.W. as in the original. This needs to become a little park wirh a bench with his name on it.. if people are allowed to build new homes everyone of these homes will be torn down.. Albany is being ruined and too many transplants dont care..
Albany seems to have an obsession with the past, not unlike hoarders – psychologically challenged folks determined to hang onto everything regardless. This prevailing psychosis is holding Albany in a form of “Nostalgic Stasis,” a progress-crushing malaise insuring a backwards-gazing outcome for rear view mirror devotees. Albany’s fine collection of historic architecture offers something unique to Oregon. Just like Ashland has Shakespeare. That doesn’t mean that newer playwrites aren’t accepted and enjoyed in Ashland; and indeed some of Will’s work rarely gets attention. In Albany we have new neighborhoods, new buildings and builders that we applaud. Yet we honor a time that is past: a way of building homes, churches and commercial structures that makes Albany special. And to that end our city and interested citizens attempt to salvage the architecture that is still viable. I thank them for their efforts. Great comment, and wholeheartedly agree. I’ve read but refrained on commenting on this site so many times, just to stay away from dwelling on problems but it’s refreshing to read this. The commenter above yours states there is too much focus on history; maybe there is a lot, but there is much history to honor in Albany! It truly is one of the things that makes this city uniquely itself. A city has (and should have) many parts that make it unique–alive even– or why live there? We can honor the past, present and future with the right balance. We had an unfortunate building inspector at the time the Draper house was torn down. She wanted 338 6th Ave. ,across the street from the Draper house, and 532 Baker removed as well. All three were in the same sad, garbage filled, state of multifamily rental abuse. I advocated for their salvation. Now, 338 and 532 Baker have been restored are strong contributors to our Hackelman historic district. The Draper house could have and should have been restored as well.